Having a floor mattress that can be used in different ways depending on the specific needs is a big convenience, right? Moreover, they are usually cheaper than real mattresses we use. Knowing the high demand for these types of mattress, we are going to dig deep into this topic to discover the best floor mattress are widely used in the market. Along with that, for those who are looking for a futon mattress or roll up mattress, we have a list of them for you. Space-saving ability – floor mattress are usually designed to be folded, which makes it easy to keep hidden away when not in uses. Along with that, they are available in small sizes. This helps it save the space in the room. Multiple uses – it is deniable the convenience of the mattresses allowing you to use in different ways. In one investment, you can turn it into a floor mattress, or yoga mat, or camping mat, or else. This obviously saves your money. Budge friendly – along with the advantages when using, most the floor mattresses are at low prices. Meanwhile, the real mattress would cost expensively to purchase. So , why we have to spend a lot for the thing we aren’t going to use frequently, right? Tri-fold mattress or folding mattress – this type allows users to use in two common ways. One is a bed when it is fully open. And the other will be a sofa that has a back to lean against. The materials of this type are mostly memory foams or foams. These materials make it a sturdy and thick in shape. Lastly, the removable and washable cover is usually included. Rolling up mattress – the fills of this type mostly come from cotton, kapok or polyester. Those can provide the softness and good cushion. The fill is stuffed inside an outer cover that can’t remove. It can be both hand-stitched and machine-stitched. 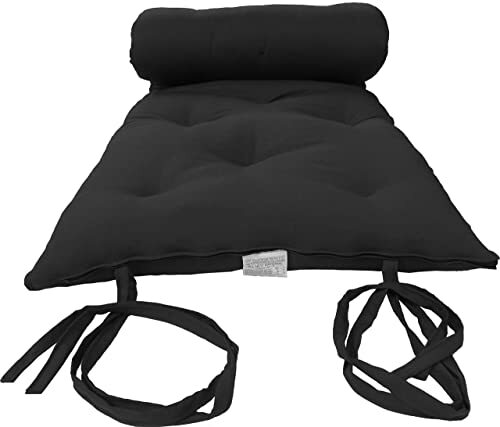 The ways of usage of this type are usually for doing exercise, camping mat, massage mat or floor mattress. What is the best mattress for sleeping on the floor? There are plenty of floor mattresses you can pick. They come from different styles, designs and types. Which one will suit your needs? The details of each recommended product will tell you. If you’re hunting for the best futons to buy, a best floor mattress for your future sleepovers, or a mattress that can turn into a sofa. Here, you’ll find a top rated selection for both average and small budgets. 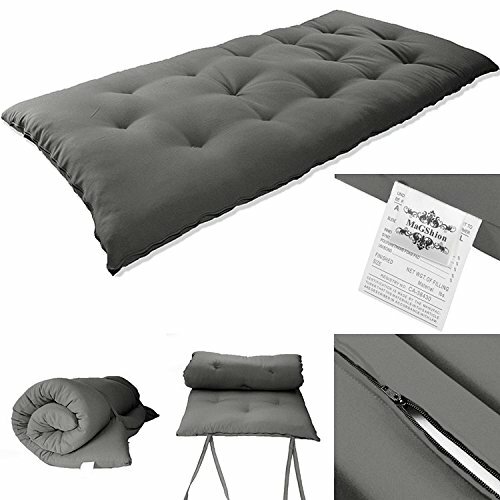 If you are looking for something that can serve as both comfy bed at home and camping, this D&D Futon Floor mattress can be your perfect pick. It is filled with white cotton, a layer of polyester fiber and a layer of foam, forming 3 inches in total thickness and 5 lbs in weight. The filling makes its firmness not too hard or too soft to ideally sleep on. When needing to store or taking somewhere, it is easy to be rolled up. Comfortable cushion for bedding: The combination of three materials for filling makes D & D Futon floor mattress a great softness and firmness, which all primary sleeping positions can feel comfy and relaxed all night long. Especially, it can relieve the pain in your back and not pose a threat to experience back pain. 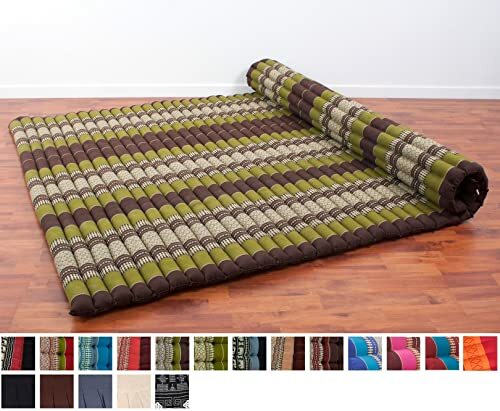 Multiple purposes of usage: Ideally, D & D Futon floor mattress can be used for different purposes such as a bedding at night, a lounging for watching movies, playing games, doing things in daytime, an additional bedding for visitors coming over, and a mat for doing yoga or any exercises. In addition, it is doable to carry D & D Futon floor mattress if you’re travelling with your car. That’s because it can be folded up neatly to put in the trunk. 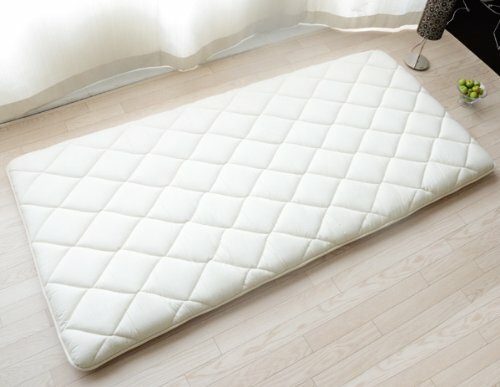 Convenience when using: If you have small space, the using of D & D Futon floor mattress becomes space-saving bedding. It can be stored in daytime and used in night time. More ideally, the tasks of folding up the mattress and rolling out this mattress aren’t a hassle. It is totally easy to do and not time-consuming at all. If you need an extra bedding when visitors come over your house but it allows you to keep hidden when not in use, Milliard Tri Folding Mattress is worth your consideration. This mattress is made of foam, which can provide a nice cushion to sit or lay on, yet has a good firmness to not bottom out within a short time. In addition, when being folded, the mattress becomes a neat shape that can be easily stored. Simple to use: The design of Milliard Tri Folding Mattress is simple and neat, meaning no intricate patterns and no assembling tasks are included when it comes to the usage. So, it will take you no time to fold when not in use and fully open when you need. Plus, the foam is dense, but light in weight. This makes it effortless to move around your house. Along with that, the cover is removable and washable, which helps you easy to take out of the core for washing. Perfect for saving space: Tri folding mattress is popularly used when needing space-saving due to small size and foldable feature. 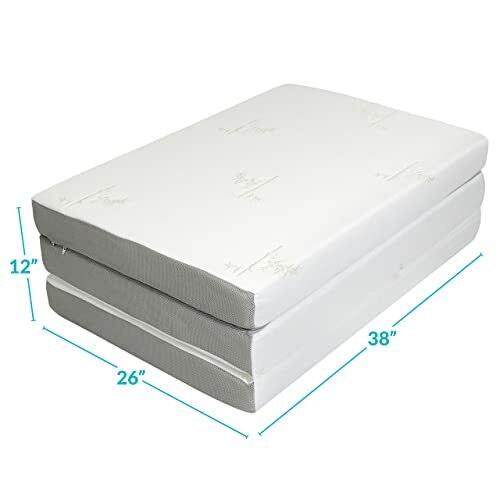 With this Milliard tri folding mattress, the full size when being fully opened measures 75in.x25in.x4in, meaning it fits perfectly one sleeper. Along with that, after being folded, you can even slide it underneath your bed for storage. Comfortable to sleep on: The mattresss is made of foam, providing a great softness and cushion when sleeping on. In addition, it is firm a bit, which can fit the needs of stomach sleepers and back sleepers, but may not please the side sleepers. Good quality foam: The foam used for the core is good enough to stay with you many years. Also, its firmness can guarantee the ability not to sag or bottom within a short time. However, it may be too firm a bit for some sleepers who prefer the softer feeling. 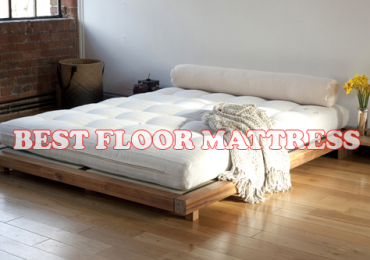 Floor bed mattress isn’t only used for sleeping, it can be taken of advantages for other purposes. That being said, you may compliment on this Japanese futon floor mattress due to its great quality and convenience of different usage. Comfort and nice feel: For making its quality, the filling is made of cotton batting and one 1/2″ layer of foam in the middle. The materials allow the mattress to provide a great softness and nice feel while lying. You can feel the softness right from the first initial touch. Definitely, this won’t disappoint those who love more hug while sleeping. Being well-built and durable: Along with that, it comes with a cover made of 100% polyester. This comes as a protector for the core, so you can keep it longer. Also, the stitching is well-done, adding to the mattress an extra durability. Due to this fact, it will be less likely to experience wear and tear if it is constantly using in different situations. Suitable for different purposes of using: If you have a small room, and need something space-saving and allows to be stored away when not in use, this Tatami Floor Mat is obvious a best choice. It allows you to fold it up easily in seconds. Plus, the weight of the mattress isn’t too heavy to take around. For being said, it will be practical to use when travelling somewhere. More ideally, if you need a mat to do yoga or any exercises, Tatami Floor Mat is also good to use. Japanese products are very well-known for their quality, right? And, if you are fan of Japanese products, this Emoor Japanese traditional futon mattress is worth your consideration. Especially, Emoor futon mattress is available in different sizes that fit the bed mattress sizes, so you will have options to choose. High quality materials: The materials used for the stuff and the fabric that protect the stuff are both good for providing comfort but different. The stuff is made of 100% Polyester of 3.49 lb contains 50 % TEIJIN MIGHTYTOP (R) ll ECO, meanwhile, the outer fabric is constructed from 100% cotton. The similarities they share are the nice softness when touching, and the breathability. What’s more? The materials allow the mattress absorb moisture instead of retaining heat and producing warm feeling. 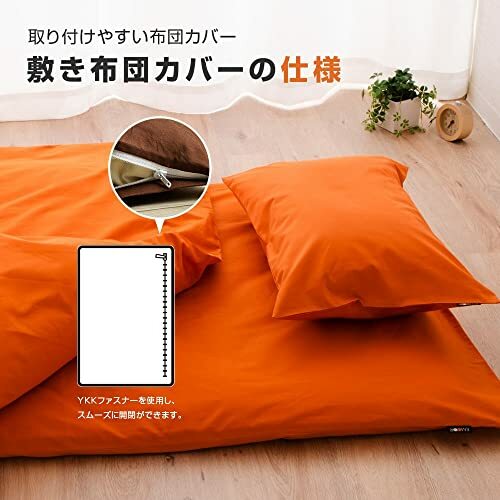 Great to place over the mattress: Along with spreading directly on the floor, this Emoor Japanese traditional futon mattress can be also used the place over the mattress. It will add an extra comfort and cushion for sleepers. In case, you feel your mattress too soft to be comfortable. This Emoor futon mattress will firm it up a bit, so that, you will get your right firmness and support. Additionally, due to the good firmness, this futon mattress can fit the needs of the majority of sleepers. What’s more? By this way, your mattress can be also protected, which may increase its lifetime. Easy to fold and light in weight: The nice thing is you won’t experience any hassle while using this Emoor futon mattress. It is easy to be folded up and spread out on the floor. If you need to take it with you somewhere, its weight won’t be something bulky and heavy to feel annoying. For twin size, it just weighs about 11 pounds (5kg), and the full size weighs 15 pounds (7kg). Mattresses made of natural materials are most preferred because they contain no harmful chemical substances and no alllergens. That mean they are safer to health and especially friendly to sensitive skins. Leewadee is a Roll Up Mattress constructed from such a material. The filling used for this Thai futon mattress is made of kapok and totally untreated. Here are the great features of this Kapok mattress. Beautifully aesthetic look: There is a compliment on the outer fabric of this Thai mattress. Its design is inspired by the woven fabric of traditional Thai design, but doesn’t sacrifice the modern look. The patterns look really nice and cute. In addition, Leewadee is available in different colors with different patterns on each, so you don’t have to worry about a limited collection of options. Well-constructed: Though, the mats are hand-made, but it doesn’t mean it isn’t as durable as machine-stitched. The fact is it is double-stitched for avoiding loose seams. And, each seam is well-done by a professional craftsman. Hence, it enhances the durability and avoids ripped and frayed seams whatever how frequent you are going to use it in different purposes. Nice Feel and great comfort: Kapok is indeed a great natural material harvested from the Kapok tree. Generally speaking, it provides rather similar feel to the cotton for the softness, breathability, moisture accumulation and non-allergens. However, the differences are Kapok is lighter, and fluffier than cotton. When lying, you are easy to feel the softness and the comfort. Your body will sink into it but the thickness of this mattress won’t let you feel the solid floor underneath. More ideally, it doesn’t produce warm feel because it doesn’t absorb and retain heat. Multiple usages: In addition to using for sleeping, this roll up Thai mat is an ideal choice for massage mat, doing exercises. If you are planning on using it for picnics, the total weight isn’t heavy to be carried around. Furthermore, it can be folded easily. How about mattress that allows you to use as a sofa in daytime and turn into a bed at night? It would be super convenient, right? If you are looking a mattress like this, you should give a look at this LUCID 4 Inch Folding Mattress. Multiple usages: The mattress has 4 distinct pieces of foam that can be assembled as a sofa or a bed, depending on your needs. 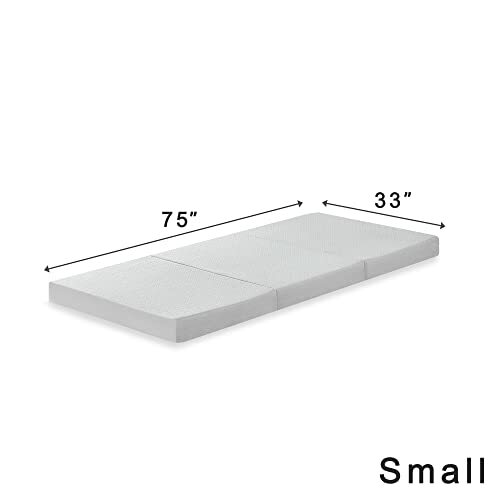 When assembling the pieces of foam together to form a bed, it measures 39″ x 75″ with 4 inches in total thickness. And, the Queen size fits two sleepers. As being said, this Lucid mattress will be a nice choice for those who sometimes have sleepovers, or have small room, or those who just seek for convenient pieces of furniture or bedding. Good quality foam: Due to the good quality foam used for the base, this Lucid mattress won’t be easily getting bottomed or sagged out in short time. In addition, the mattress is firm a bit, but not in uncomfortable level. Hence, it can fit the needs of the primary sleeping positions including back, side sleepers. However, as the common problem of foam, this mattress absorbs and retains heat. 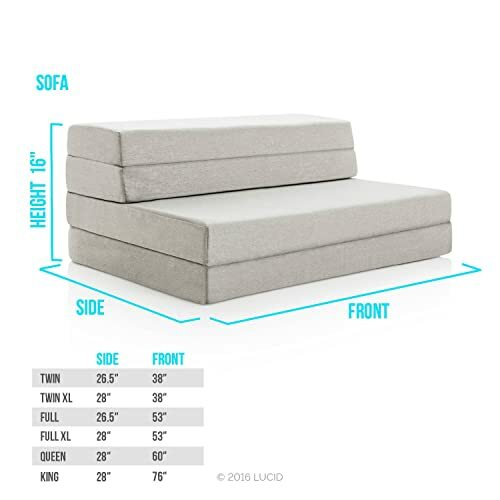 Easy to assemble: When it comes to purchasing this Lucid mattress, the instructions are included. That means you are no need to worry about how to assemble by yourself at home. The steps are easy to follow and won’t take you long to do. If you are looking a foldable memory foam mattress, this Best Price mattress is worth your consideration. It can provide you an extra sleeping surface when your guests cover and want to stay overnight. Apart from this purpose, it also adds you a convenience if you want to turn it into a lounge to sit on while watching Tv or doing things. Additionally, you can place this mattress over your sofa to provide an additional cushion or softness. Ability to hold heavy sleepers: The mattress is made of 1.5″ of memory foam and 2.5″of high-density base, forming to 4 inches in total thickness. 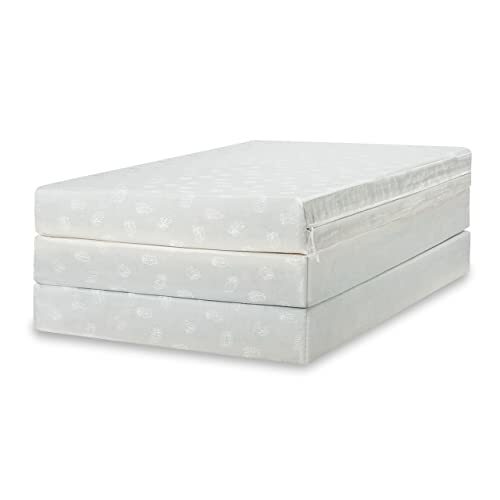 More ideally, the memory foam used is made of high density type, which can provide a good firmness and durability. Hence, it won’t be easily sagging in short time. Even, it has to hold heavy sleepers. That being said, it has actually ability to hold a sleeper weighing over 200 pounds. Great hug and softness: As the common feels of memory foam mattresses, it can provide you more hug and sinkage when lying. When pressures are placed on the top, it will be sunken down into the mattress. However, you never feel the solid floor underneath. That’s because the good firmness will keep you on top. No odors: Memory foam mattresses are well-known for odors. But, to solve this issue and provide the pleasant smell to sleepers right after being first unpacked, the memory foam is infused with ActivFRESH charcoals. This method will eliminate the unpleasant odors of memory foam, and make it fresh. This Traditional Japanese Floor Futon is the second mattress coming from Emoor adding to the list of best floor mattresses. So, let’s see its great features, to know it achieves the good reputation for quality. Well-built and durable: The futon mattress is well-built and sturdy. All the seams are done professionally to ensure they won’t go ripped or loose, even the mattress is used under stress. Hence, the frequent use of the mattress won’t easily make wear and tear. Furthermore, it has the durable cover made of fine cotton. Though it looks thin, you can’t see through it. This adds a protection for the fill. Cool feeling: Cool feeling is also important when it comes to choosing a floor mattress. This ensures you not to wake up sweating during the night. Thanks to the breathable materials used for making this futon mattress, sleepers can stay cool all night long and have a restful sleep. No bacteria, no mite and odors: During manufacturing process, the materials are treated well to be anti-bacterial, mite-resistant, and odor-resistant. This makes the mattress friendly to all types of sleepers, especially who are sensitive to chemicals, and odors. It is obvious that tri-fold mattress is convenient and space-saving. That’s why this type of floor mattress is highly recommended in this list. In addition to low price, tri-fold mattress is easy to use and transportable. Here are the great features that you should know about this Zinus memory foam mattress. Good construction: Mostly, the tri-fold mattresses are simply designed and made of one single piece of foam. But, this is not the case of this Zinus tri-fold mattress. Its construction is fairly similar to a regular mattress used to place on the bed. That means it is constructed from different layers of foam including 1 inch Memory Foam, 2 inches Viscolatex Responsive Foam, 1 inch High-density Base Support Foam. This provides unique feels. It has the softness memory foam, bouncy feel and responsive ability. All these feels provide the great comfort and support for sleepers. Easy to fold, and convenient to use: The design of this Zinus can reduce the hassle when using. That means it is easy to be fold up when not in use or want to put away. The neat shape after being folded can provide space if you have small room. Along with that, the total weight of the mattress is light, making it easy to move or take around the house. The last best floor bed would be this DHP Futon Mattress. The only floor mattress made of pocket coils is included in this list. As being said, the unique construction of this mattress will provide unique feels for sleepers. Especially, in addition to serving as a floor bed at night, this futon mattress can be turned into a sofa. This provides a convenience for users when having it at home. Let’s see more! Great comfort, great bounce and responsiveness: Due to being made of pocket coils and gauge, the mattress is fairly bouncy and responsive. When pressures are placed on the top, it can response quickly. In addition, the quality foam and polyester layered between cover and coils adds a great cushion, and softness. You can feel the comfort right away you put your body down on the mattress. Along with that, the microfiber mattress cover adds an extra cushion to the mattress. Cooling feel: Unlike memory foam mattresses, this springy mattress will be less likely to experience heat retention. The construction allows more air to flow through the mattress easily. Hence, the chances of experience warm feeling during the night become least. Multiple uses: It is possible to use this mattress in different ways. 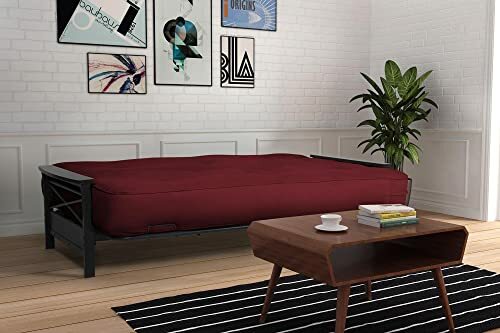 When your friends or relatives come over your house, this DHP futon mattress will be a nice bed for all type of sleepers, but, in the usual days, you can make it become a comfy sofa. How convenient it is! Hopefully with the top 10 best floor mattresses we selected above will help you find a good product. Please register and follow us to get many other mattress reviews.